Last year the name Nine Inch Nails or Trent Reznor was mentioned a lot, when someone was talking about the future of music marketing. Trent has developed a complete new way for music marketing using the whole potential of web 2.0. He demonstrated on how many ways you can connect with fans and how you still can give your fans a reason to buy in the digital age. There is more than MySpace, there is more than just giving your songs away for free in hope the audience comes to your live shows. Mike Masnick was summarizing the NIN Campaign in his presentation given to MidemNet this year. The year 2008 is nearly over and we are still having a situation on the digital music market that cause entrepreneurs like Michael Robertson (CEO of MP3tunes) to write articles with headlines like: Legal digital music is commercial suicide – Fans suffer as lawyers get rich (Article for The Register). Still record labels or copyright holders (collecting societies) are torpedoing successful music services with big financial requests from labels for “past infringement”, plus a hefty fee for future usage. The problem is that changing the copyright law will need many more years – (Creative Commons and Lawrence Lessig are unfortunately no superheros) – … so the market has to be faster… has to find a solution… has to create an environment, where innovative business models can be develop without the fear of being sued the rest of your life. Why is there no chance to negotiate a true partnership between net companies and the content/copyright industry, where going legal is a real option for a start up, where both sides get the ability to create a profitable business? 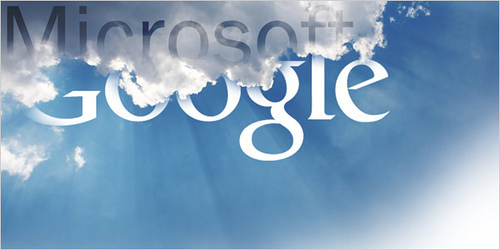 Even Microsoft is starting a big PR campaign now around it`s new platform Windows Azure… ” the future is cloud computing”…. so it`s going mainstream, although most internet users are still unaware of the term “cloud computing.” They are already taking advantage of it more than they know. When we talk about cloud computing we mean an architecture by which data and applications reside in cyberspace, allowing users to access them through any web-connected device. This includes: webmail services like Hotmail or Gmail; personal photo storage services like Flickr; online applications like Google Docs and Photoshop Express; video storeage and publishing services like Youtube; blogging platforms like WordPress; social bookmarking sites like Delicious; social networks like Facebook; and of course online servers where you can backup your harddrive or any other personal files..
… and it should be just a matter of time for people to accept that cloud computing is superior to desktop applications in all areas of software or media usage and so the hardware industry will respond on it with new devices. Mobile device of all kinds will profit a lot from this developement. Of course people have many concerns about cloud computing like security and privacy, but there will be some solutions to give the users a “safe feeling”. … anyway, this will be a big challenge. So cloud computing is coming fast… what does this mean for the media industry? Yesterday I read an amazing WIRED article! Well… great magazine…. but this one was from 1995. Remember how computers and mobile phones looked in 1995? The article is about a new way of looking at compensation for owners and creators in the net-based economy. The author, Esther Dyson, predicted in her article all the problems the media industry will be confronted with in more than ten years time cause of digitalisation. She wrote about all the challenges for owners, creators, sellers and users of intellectual property. About the fact that quality content will be free, easy to copy but hard to find. And she made suggestions how content creators can find ways to be paid. The article could have been written last year … and still it would be a great one. “In a new environment, such as the gravity field of the moon, laws of physics play out differently. On the Net, there is an equivalent change in “gravity” brought about by the ease of information transfer. We are entering a new economic environment – as different as the moon is from the earth – where a new set of physical rules will govern what intellectual property means, how opportunities are created from it, who prospers, and who loses. “With the means of production growing cheaper and easier because of the Net, a bifurcation will take place: more and more people will produce material for smaller audiences of their friends, while those seeking large audiences will give their stuff away or seek payment from a sponsor – and try to persuade influencers to recommend it. This was all written 13 years ago!!! In times where we still, well at least in Germany, discuss “illegal product placement” cases, Hollywood does its homework for years now. 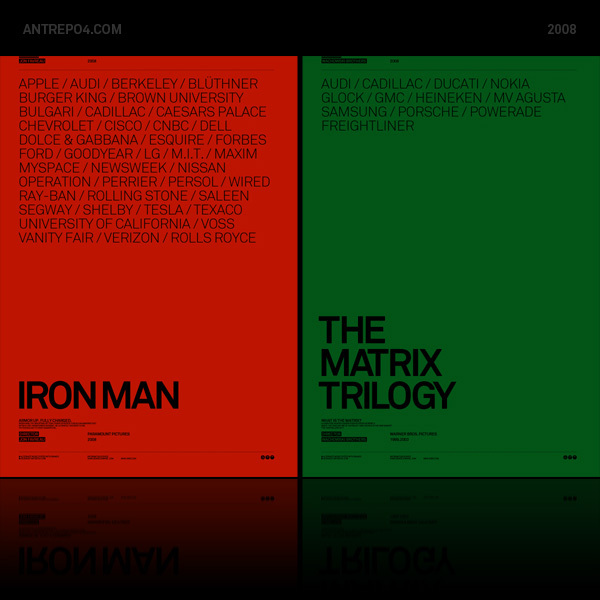 Antrep04.com made nice “alternate movieposters” with the “real new stars” of a movie production. Once again a TED talk… sorry for that. 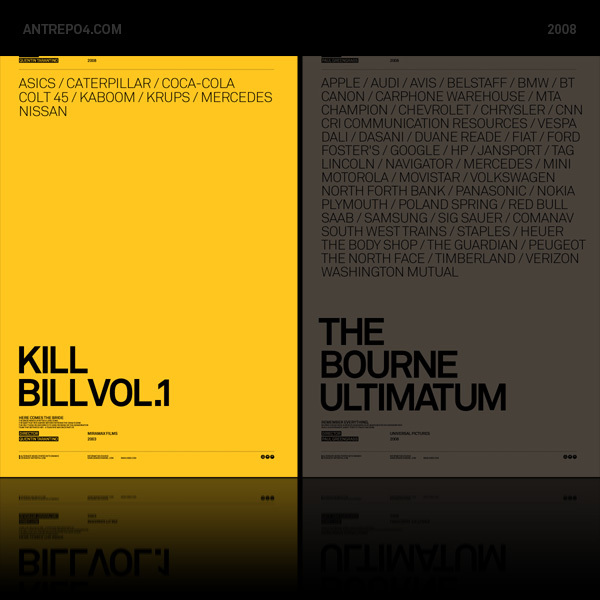 But this is a really great one, even though it`s from 2006. Game designer David Perry shows that tomorrow’s videogames will be more than mere fun to the next generation of gamers. They’ll be lush, complex, emotional experiences — more inclusive and meaningful to some than real life. A highlight is the video inside the talk by a student Michael Highland who describes his life as a video game addict. Game developers have a tremendous responsibility in the future… “brainwashing” was never as easy. If you don`t know what I mean, watch the video of Michael Highland. Is Ubiquity After Scarcity The New Way To Make Money? And I fully agree. In a time where we have no control over distribution anymore, where we get networked, where every user is potentially their “own distribution channel”… in a time where we are talking about the Attention Economy… scarcity makes no sense anymore for digital media products. We must realize: Attention is the scarcity now, not (even good) content anymore. And immediately publishing your content for free on your own website, like NBC is doing on Hulu, would be just the first step. Content syndication could be a very important thing in the future. Get your content in the “pole position”, make cooperations, go there where the traffic is and make your content available… and as a content owner, maybe you market your potential ad inventory yourself and the platform owner gets the content (with the attached ads) for free. So… try to go where the traffic is. 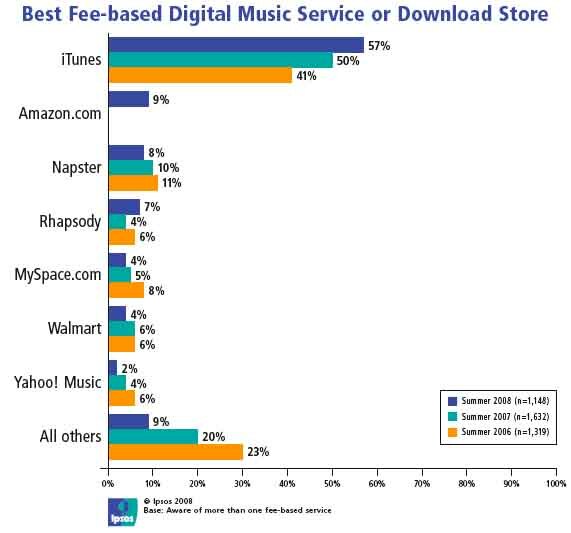 A survey of 1,148 Internet users in the summer of 2008 revealed 58% of people believe iTunes is the top fee-based digital music service or download store according to a report from market research firm Ipsos. By far the best known brand is also iTunes with an unaided awareness of 39%. (Second is Napster with just 13%). Hopefully this dominance won`t be a problem for the music industry to establish or improve their business or pricing models. These figures show that most people still think there is just one brand out there. And if you know just one brand, you won`t know the business or pricing models of other brands… right? Best example: Last.fm. Maybe one of the most innovative music services out there at the moment, but it faces incredibly low unaided (0%) and aided (6%) awareness. And the time it takes to get a high awareness, even when you are a “mainstream brand” is a long journey. 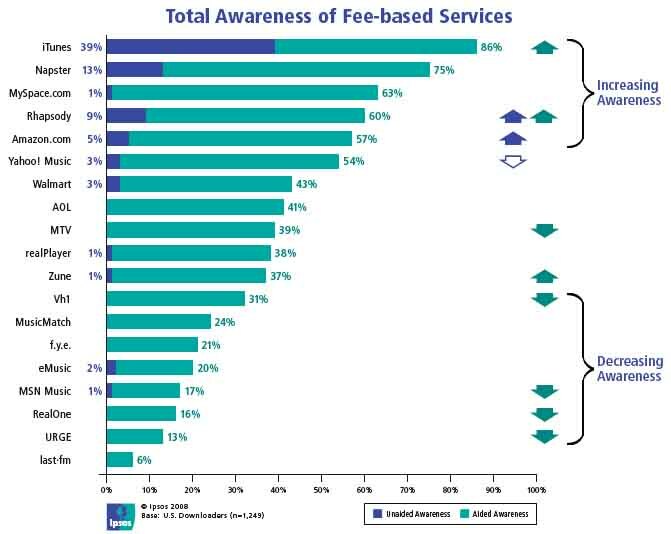 This is shown by the Amazon example, who get just 5% unaided awareness in their first year in the music download business. Universal McCann publishes every month a small “brief for executives” titled “Trend Marker”. In July they had the theme “Welcome to the “Free” World”. It`s 12 pages long and summarizes some interesting facts about this new “culture of free access”. It shows why this “Free Culture” exists, what the business models are and has some case studies of brands, who already navigate the “free world”. The paper is just a short overview, and it claims not to cover the theme completely … I`m looking forward to Chris Anderson`s new book for that… but it summarizes some points of this area quite good. Gerd is doing a great job out there for years now and his blog is really worth reading. Here a video of his speech at the Picnic Conference in Amsterdam last week. He summarizes quite well what`s going on in the new attention economy and how the music industry can survive in it building an new Ecosystem. Watch it. It will be 50 minutes well spent. Really great stuff.